Such was the case on Superbowl Sunday for a party of 14. 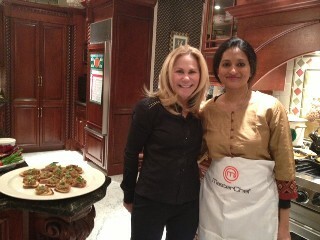 Nandini Anant, a contestant on MasterChef Season 3, was in attendance to cook up some delicious appetizers with an Indian flair as some of the guests have planned a trip to India in several weeks. Hosted by David and Debbie Maurer-Hollaender, the night was a huge success and the gourmet kitchen perfect for creating the delectable meal. And of course the custom home theater designed by renowned Theo Kalomirakis was the ideal setting in which to watch the game. Read more about this wondering evening here. And more about this exquisite home here.